Jordy Smith, Mikey February and Frank Solomon join Cape Town investment hub Wesgro for the #ItsAllStillHere campaign to put the city back on the world map after a severe drought. The #ItsAllStillHere campaign is a tribute to the beauty and attraction of Cape Town in the wake of the worst drought in its history. The campaign comprises three short clips - see the first on Jordy above. We will roll out the other two of Frank and Mikey when they drop - that profile the Cape's top surfing talent, natural beauty, and world class surf conditions. It shows how Cape Town got through the crisis while highlighting that "Its all still here". Each video features each surfer explaining their relationship with water, and how the recent drought affected not only them, but the province as a whole. 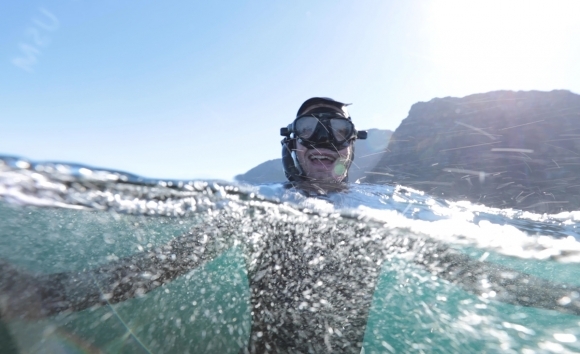 The message across all three videos is a clear call to action: Cape Town and the Western Cape is a leading destination for responsible tourism, and adventure tourism, with some of the best surfing conditions on the planet, and is open for business. "In the films, our surf spots give a taste of our world-class attractions and scenery, and show that our breath-taking adventure tourism experiences are all still here - waiting for tourists from around South Africa and the world," claims the press release. “When Frank approached us with this idea of using globally recognised local surfers to help tell the Western Cape story, we saw a great opportunity to tie in a positive message about water," commented Judy Lain, Wesgro’s Chief Marketing Officer for Tourism. “Jordy, Frank and Mikey were the perfect ambassadors for the face of this campaign considering their achievements and extensive social media influence and reach, and passion for the province." 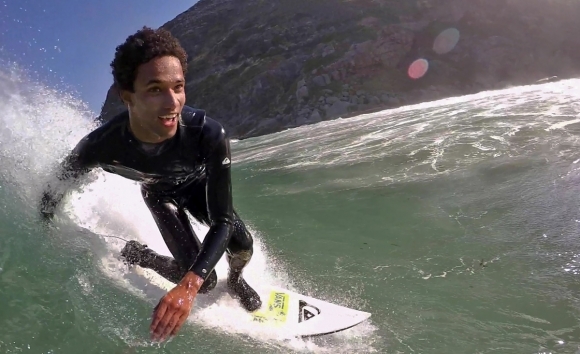 HAPPY CAMPER: Frank Solomon is the perfect ambassador for the waters of Cape Town. Jordy Smith is hailed as South Africa’s top surfer and most successful – currently ranked fourth in the world and finishing runner-up on the World Surf League (WSL) Championship Tour (CT) twice. Despite being on the road to compete year round, he is locally based and a proud ambassador of Cape Town and the Western Cape. Frank Solomon is hugely popular and celebrated as one the Mother City’s top big wave surfers. No stranger to the camera, he’s the star of the Emmy Award-winning mockumentary ‘Let’s Be Frank’. Hailing from Hout Bay, Frank is passionate and actively involved in eco-friendly initiatives, and runs a surf project for under-privileged children. Mikey February, the first Cape Town surfer to make it onto the WSL CT when he joined the world's top 35 surfers on the tour this year grew up surfing the waves in Cape Town and the Western Cape. Mikey's unique flowing style has stamped his mark on world surfing, while making him a role model for young South Africans to realise what is possible. The videos were produced by Sledgehammer Studios with Sacha Specker - a local videographer and photographer - who generously provided additional footage. STYLING BRU: Mikey February has rapidly established himself as a Cape hero. This is cool but I don't see how as surfers we can honestly promote surf in Cape Town without first dealing with the sewage problem which is a real threat to our health.